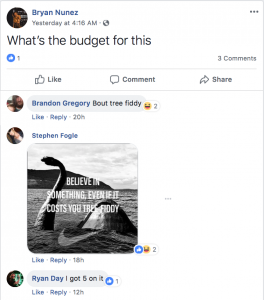 Facebook: The last refuge of the drab and glib, a social platform that has become as boring as it has ostracized; no more news, no more slapdash over news, outrage that is limited by a new algorithm that no one understands. 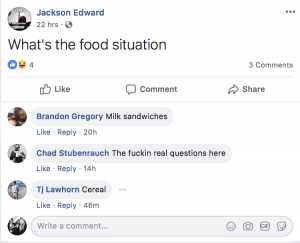 Where has all the Facebook shenanigans and tomfoolery gone? 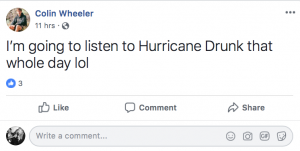 Well, look no further than the vast array of Hurricane Florence event listings and their subsequent conversations. 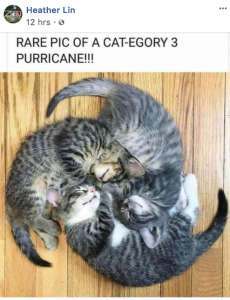 They are as glorious as they are clever. 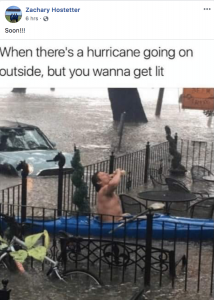 Given the trajectory of the storm, those intrepid souls who are not out hoarding supplies or doomsday prepping in both South and North Carolina and our own Virginia, have been at home creating these events and they are everything on this dreary Wednesday. Study abroad is a right of passage for American youth everywhere. The pros: A lifetime of memories, cultural immersion, and making America great overseas. The cons: Having to listen to the same youth talk about how cultured they are when they return. 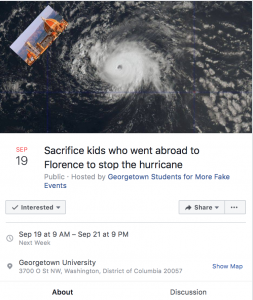 Something this Facebook event originating out of Georgetown University got 100 percent correctly when they said, “We all hate rain, but the only thing worse than rain is the kids who studied abroad and won’t stop talking about it. 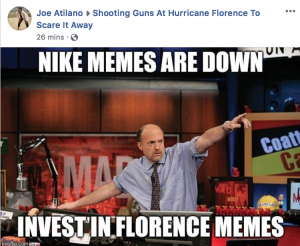 In order to rid our society of two great plagues, please join us to sacrifice everyone that won’t stop talking about the limoncello, gelato, and fresh pasta they ate in Florence.” While the event has 266 confirmed attendees and 469 interested, unfortunately, no one has actually contributed to the conversation. 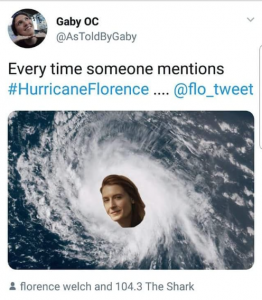 In an obvious move, those in Washington D.C. are hoping to brave and ultimately conquer this storm by rocking out to the sweet, sweet, sweet melodies of Florence and the Machine. And with 1,700 confirmed attendees with another 6,600 on deck, this event will not disappoint. 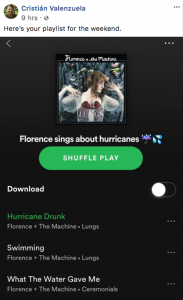 While lacking some of the lackluster and gusto of other events, the listing does encourage you to, “Listen to Florence and the Machine in the comfort of your home while the hurricane hits!” which is never a bad idea. 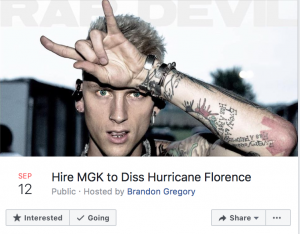 Norfolk, which might be one of the locations most impacted by the torrential torrents of terror, was sure not to be out-done and is now planning an event whereby rapper “MGK”, aka, Machine Gun Kelly, will “diss” the incoming hurricane. No further details were offered by the organizers, yet 352 people have agreed to attend with another 1,200 weighing their options. That Eminem diss video certainly shook things up. There is only one conversation point, which sums up this event in its entirety. 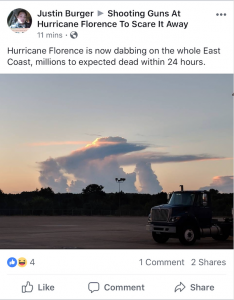 There you have it Virginia, South Carolina, North Carolina, and Washington D.C., all the events you will ever need to weather (zing!) 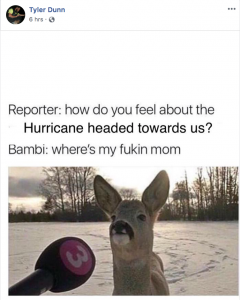 this stormy apocalypse. 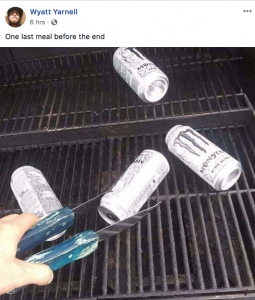 Be sure to check out RVA Mag’s survival guide and good luck out there. 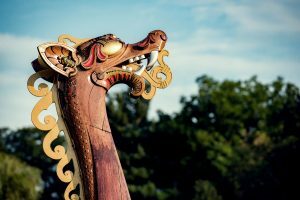 The Draken Harald Harfgre is the world’s largest Viking ship, and it is sailing to Norfolk next week, which is quite possibly the best news the Commonwealth has received all year. Sigurd Aase, the owner and captain of this scourge of the seas has one simple mission: “The aim of the Draken Harald Hårfagre project is to explore the world and embrace the Viking spirit – to look beyond the horizon and seek adventure and to inspire people to take on challenges.” Aase, a Norwegian entrepreneur took his vision to the best ship builders and historians in Scandinavia to bring the ship to life, the Draken Harald Harfgre is the largest Viking ship currently at sea and is twice the size of ships unearthed archaeologically. WTKR has reported that the ship will sail into Norfolk on Sept. 13 – 16, and in partnership with Nauticus and Sail Nauticus, will dock at Hampton Roads Naval Museum on its Expedition America: East Coast Tour 2018. During the tour, the ship will port at 14 harbors across the U.S. from Maine to South Carolina, including stops in Baltimore and Washington, D.C. The ship, named after legendary Viking Harald Hårfagre, the first king of Norway (who is a featured character on the show “Vikings”), was assembled in the town of Haugesund in Western Norway. Interestingly, the Vikings did not record their process for building ships or how they were sailed and navigated. 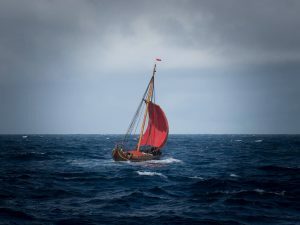 According to Aase, the Draken Harald Hårfagre is a model of what would be referred to as a “great ship” and was re-created based on archaeological evidence and supplemented with evidence gained from the old Norse legends and sagas. In the U.S., most school children are taught about Columbus’ discovery of North American in 1492, yet new evidence suggests that the Vikings beat him to the continent by around 500 years. The Viking explorer who discovered the continent, Leif Eriksson, was born in Iceland, but raised in Greenland. His exploits in North America eventually took him to present day Newfoundland and were turned into sagas around the 11th century before being written in the 12th and 13th centuries. The Viking ship set sail for the first time since 2012 with sea-trials being held off the Norwegian coast between 2012-2013. Her first voyage was from Norway to England in 2014. The schedule for the ship’s events in Norfolk can be found here. And for those looking to set sail on a Viking ship of their own, well you’re in luck, because there’s one for sale right here in Richmond. All photos from the Draken Harald Harfgre’s Facebook page.